1) Left Guard- After the shocking retirement of pro bowl guard Kris Dielman the Chargers are in need of a left guard. He was fairly impressive last year when stepping in at the numerous times to cover injuries. Sandwiched between Gaither and Hardwick, Green will likely be targeted but if he can step up and get in some good blocks then the Chargers left side will be strong. 2) Right Tackle- Jeromey Clary will be starting for the Chargers this season which will worry San Diego Fans. Although he isn't on Rivers' blind side, he could be a big weakness on the line and Rivers will likely have to dodge a few linebackers running at him from the right. I can't see Ryan Mathews running towards the right side as often as he'd like as well unless Clary improves significantly. If he does play well however it will be great for Chargers with Gaither being very impressive last season on the blind side. 3) Defencive End- Neither right or left defencive end players for the chargers will induce fear in to many offencive lineman in the league. Vaughn Martin, Corey Liuget and Luis Castillo are the defencive ends. Last year Vaughn martin emerged as a pretty decent defencive player for the Chargers but never really blew anybody away. Corey Liuget has been a little disappointing thus far managing just 19 tackles and one sack. The Chargers will be hoping the 1st round pick can improve year on year but this year I cant really see him being a major force on defence. Luis Castillo only started one game for the chargers before being placed on IR for the rest of the season. He has however had a pretty decent career with the Chargers and is probably the most likely to succeed and brings important experience to the position. 4) Cornerback- The chargers have used plenty of first round picks on corner backs over the last few years looking out for a number 1 cornerback. Jammer has filled the role fairly well and I'm not too worried about him. 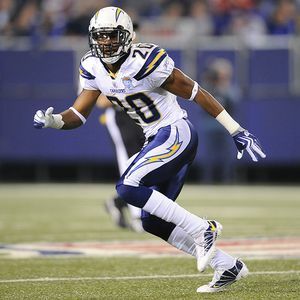 Antoine Cason has looked vulnerable at times for the Chargers and has given up a few big gains. He hasn't been shocking, but neither has he been particularly strong. Number three is second year man Marcus Gilchrist who was targeted by the likes of Aaron Rodgers last year and was a bit of a liability. This could change with minicamp and more games under the belt but with two fairly inexperienced Corner Backs and Jammer being the wrong side of thirty, the chargers look quite weak at the position. 5) Strong Safety- With Eric Weddle at Free Safety and Steve Gregory leaving, the strong safety position is very important for the chargers. AJ drafted LSU product Brandon Taylor who is an exciting prospect. The question however is whether he is ready to start on defence straight away. He will have experienced backup Atari Bigby and a great Free safety to cover him, so he has all the tools to succeed, I just hope his inexperience doesn't effect the chargers too bad. I just don't understand why the Chargers don't put more emphasis on the O-line. In my opininon, it would help Rivers feel less pressure and throw less interceptions. Plus, Ryan Mathews would do better and the WR could do longer routes.